I am a Bharata Natyam & Kuchipudi dancer, a recipient of a tradition of centuries, a recipient not just of the dance form but of its attendant psychological, social, philosophical, sociological, metaphysical and esoteric constructs. Such constructs can loosely be called tradition. Along with other artistes, I am given the responsibility by virtue of my years of learning, to learn, imbibe and carry forward a tradition of a particular style of performing art. We, artistes, thereby become dynamic links between centuries, between eras, and between ideas. This onerous responsibility sits heavily upon the shoulders of each and every serious artiste. I am part of that flowing river called tradition, a perennial river, meandering, striking new courses, accepting new temples and new pilgrims, supporting old rituals, on its path to the sea. 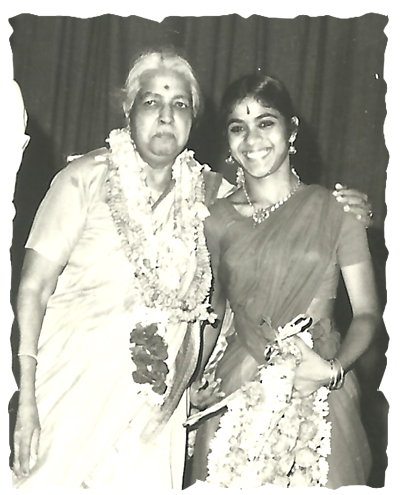 My passion for dance began early in life - a chance meeting at the Subramanyam temple in Secunderabad, when I was 4 years old - a comment that 'This child's eyes are large - you must teach her dance', saw my mother Subhashini Shankar (herself a musician and violinist) enroll me with Smt Sharada Keshava Rao. My initial years also saw me training with Sri KN Pakkiriswamy Pillai (brother of Sri KN Dandayuthapani Pillai) who then taught in Hyderabad. My dance training continued in Hyderabad, until the summer of 1973, when a mother and her very young daughter, wended their way nervously into the courtyard of a building in Chennai, India. They waited outside the office, after having sent in a message, eagerly waiting to be called in. But they were not summoned inside. Instead, the very person they wanted to see came out to greet them. The lady was none other than Rukmini Devi Arundale, the Director of Kalakshetra (Athai) The young girl was me, and with me was my mother. After the traditional namaskaram, (bowing low) I remember asking her to bless me to be like her someday. "No, no, I bless you to be greater than me, said the beautiful lady, swathed in a maroon silk saree, with her freshly washed hair falling down on her shoulders. She had made the decision for my parents and me. She scoffed at the worry of my parents about putting me into boarding. She promised them that I would be safe and well looked after. I was admitted into Kalakshetra in June 1973, to take up dancing full time. Such was the force of Rukmini Devi's personality that it affected all who came within her radiating aura. I joined Kalakshetra, exchanging pinafores and school bags, maths and science classes for Pavadai - Davani (a dress worn by young girls in South India - long skirt and scarf) and dance classes. It was a sea change! Life in boarding for most students in the first few months can be traumatic - and for me the different life styles, that I was encountering in a matter of a few days was enormous. Yet, Kalakshetra, and Athai, enveloped me in their bosom, with lots of love and affection; that the transition from convent school to traditional Kalakshetra was ultra smooth. I was enrolled as full time dance student at Kalakshetra, where I was trained by, brilliant gurus, in the true guru-sishya parampara. Simultaneously acquiring a formal education - Matriculation, Pre-University and Graduation - through correspondence courses, I spent six years at Kalakshetra, learning Bharata Natyam, Carnatic music, veena, dance theory, philosophy, Sanskrit, etc., and acquired a Diploma and a Post-graduate Diploma in Bharata Natyam. I also learnt the grace of a firmly executed movement, the need to perfect the bodily stances and thereby forget the body and rise above it, to think, to create, to go beyond and to ascend to realms of a higher consciousness. My training in Kalakshetra, went way beyond the curriculum! I was inquisitive and curious, and shored up all what I observed! I saw Athai confer with myriad artists while she created and choreographed, I saw the work that went into each of those creations. I stashed away, the way she encouraged all of us young dancers, gave me ,the freedom to also pursue my academics, and allowed me to perform solo while still being a student at Kalakshetra. I burnt into my memory the way her intellect and creativity met seamlessly in a vision of aesthetics. I also learnt from her the merits of a well balanced programme and continue to try and replicate her veritable attention to every minor detail. While I was in Kalakshetra, Athai choreographed the Matsya Kurma Avatarams, Meenakshi Vijayam, Damayanthi Swayamvaram and Buddha Avataram. I was selected to play different roles in these productions and was there when the process of choreography was on. What an experience! Seeing, creativity, come alive in front of one's eyes. And what a way to learn!. I learnt important tenets of choreography and stage craft just watching Athai choreograph and have a production go up on stage. Most importantly, I learnt that art is not mere performance, but LIFE itself. On my return to my home town, Hyderabad, - interested parents wanting me to teach their children and my own interest in sharing my art - made me a teacher of dance at the age of 17 years. I began with six students in and grew up with my young students. They call me 'akka', elder sister. At my dance school in Hyderabad - Shankarananda Kalakshetra, the relationship is that of a large family, a true guru-sishya relationship. My students learn to balance the traditional with the modern, the static body with the soaring mind. They experience the freedom to feel, to know, to break all bonds, all barriers, in an effort to touch one's self. I teach the style that I have imbibed - The Kalakshetra bani or style, with emphasis on angashuddha or clean body lines, subtle abhinaya, and an abiding commitment to aesthetics. Being in dance from the age of four, dance has meant many things to me, and yet it is not a hobby, or a pastime or even a career, but just a reason to BE. .. I had been in dance for more than 3 decades, when, the year, 2008, had other very deep and overwhelming meanings and connotations. On July 1st 2008, I was diagnosed with breast cancer. Over the last four years, I have been undergoing treatment, through surgery, chemo and radiation therapies, and am in remission now. However, through all the treatment period, I continued to dance. By bringing laser sharp focus to my dance, in all its multifaceted glory, I successfully Tuned out of cancer and Tuned into my dance. My dance saved me from myself! And today, with this experience behind me ,I once again understand the true import of what my Guru Rukmini Devi Arundale said: "Culture is neither performance nor entertainment but life and art is an expression of life".